I owned a mk1 very briefly, but it sat in my GF's garage at the time as I was too young and dumb to do anything with it. So I sold it to my brother, then we found a G40 in a scrap yard and he put it in the Mk1. He is but I'm not - it's safer for the general public if I stick to fixing old bikes! 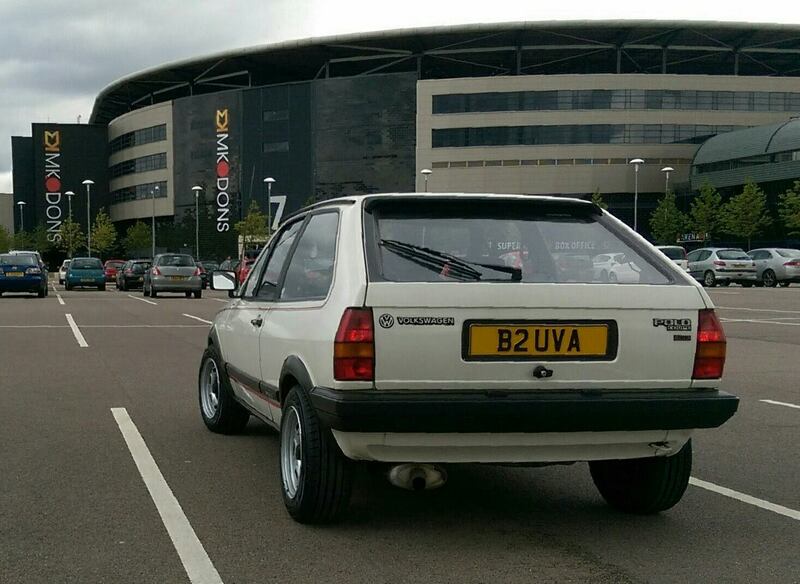 Post subject: Re: Polo MK2 - rekindling my youth !! I had a metallic liver coloured Mk2 1.1GL breadvan back in the late 80s. I remember the dreadfully heavy brakes as VW couldn't be bothered to re-engineer a servo. They do indeed work well-enough, no fade etc, but it's just the big pedal pressure takes some getting used to. Way back I had 2 MK2 coupes. An 84 and an 86. The 2nd one will always be my fave car. I did a few mods starting with a servo from BRM in Leamington Spa (they were the people who showed VW how to put it in the MK3) vented discs, flowed head and schrick cam, Webber, boge springs and shocks, rear ARB, 'lecki windows, BBS RA wheels and obligatory bee-sting. Had my baby for 7 glorious years and never ever got used to the truly hideous understeer on a wet road. Wierd really cos in the dry it could scare the Willie's out of my 16v golf owner brother. Worth bearing in mind if you plan to modify that the front suspension design is THE limiting factor. No wishbones makes the front set up flimsy. It can cope with track conditions well but on the road any mid-bend lumps and bumps or funny camber and you can get seriously out of shape. Sold him with 124k miles on the clock and the engine was still a peach with not a spot of manky oil in the sump - just like every other VW I have owned. Damn they were fine cars back then. The single best feature of that car that I really truly miss is the ventilation. Honestly. I have yet to own another car that can give you cold air on your face and warm on your feet at the same time. Warm air in your eyes when your driving is a big no no for me. This is my old one - I spent over 10yrs developing it, with sorted chassis and BCB 1.6 16v engine with cams and big bike carbs, it was nuts. Destroyed by a taxi driver 2yrs ago, almost killing me and my kid in the process.